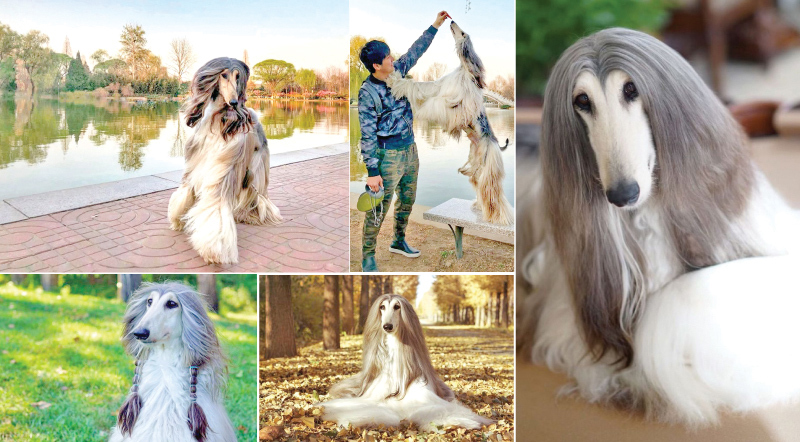 A J Nirvana Battle, a three-year-old Afghan hound from China is the canine version of a fashion model. He’s got a slender physique, loves posing for pictures and he has the most incredible hair. Looking at A J Nirvana Battle and his luxurious locks, it’s easy to see why he turns heads wherever his owner takes him. But his impeccable looks aren’t all natural. Kevin Chan, a Beijing-based marketing director, spends six to eight hours bathing and grooming him every seven to ten days, and doesn’t mind spending big money on the best grooming equipment and hair products. He claims to have spent around 100,000 yuan ($15,000) on grooming tools for his three-year-old pooch, and spends another 1,000 yuan ($150) on bathing products every week. That’s a lot of money, but Chan says it’s worth it, as he considers Battle a member of the family. 29-year-old Kevin Chan sprays a nutritious solution on the dog’s fur to smooth it, and then uses a bristle brush with talcum or baby powder to detangle knots in his fur. “Every day, I spray a special nutritious solution on Battle’s fur and comb him. I have to brush him every day, to keep his fur from knotting together,” Kevin Chan said. AJ Nirvana Battle’s owner is so proud of his looks that he bought a professional camera and took photography lessons, so he could share the best pictures on social media. He regularly posts new photos of the pampered dog on his Facebook page.